The trial was conducted in an irrigated corn on corn plot with very high residue. The plot was minimum tilled in front of the planter. 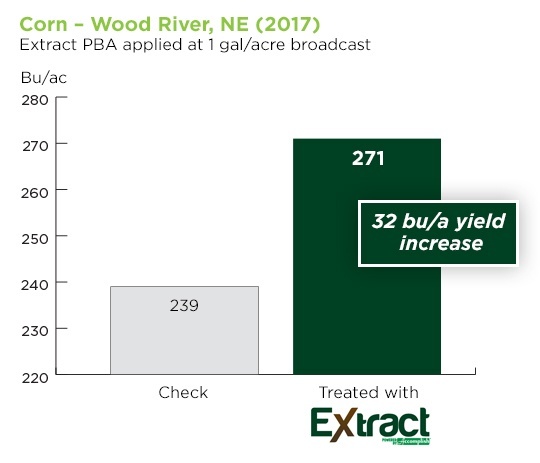 Right after planting, Extract PBA was broadcast applied at 1 gal/acre with 1 gal/acre UAN and 8 gal/acre of water. The trial was harvested at the end of October. Extract PBA is labeled for both spring broadcast applications and residue management applications. Learn more about maximizing nutrient release with Extract PBA by accessing the Extract PBA information booklet.